The Albanian flag features a unique design and color scheme which is representative of the country's history. 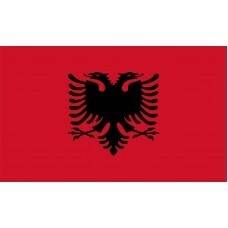 The flag includes a red background, which signifies bravery and a double headed eagle, which stands for the sovereign state of Albania situated in a black silhouette in the center of the flag. The design is bold and undeniably creative but let’s look a bit closer to the history of this flag. 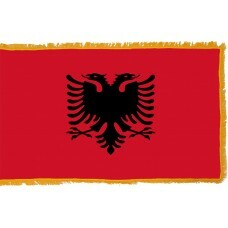 The design choices of the flag were taken from designs of the Albanian military Coat of Arms during the Byzantine Empire. The double headed Eagle was the most consistent picture used by heraldic families in the middle ages and became the Kastrioti’s coat of arms. Kastroti led the revolt against the Ottoman Empire with the double headed eagle depicted over a red field and the symbolism was carried on by the Albanian people. In 1912, the declaration of independence of Albania was proclaimed in Vlore and the flag which was raised by Ismail Qemal was adopted as the flag to represent their new independent nation. The Albanian flag has changed multiple times over the years in conjunction with regime changes. Between 1928 and 1939, King Zog ruled Albania and changed the flag by adding a crown. The crown was replaced by two faces during the Italian occupation of Albania. Then after World War II, a communist government changed the flag again by adding a five pointed golden star, which was then removed following the collapse of the communist government in April 1992. Starting from 1969 and all the way into the 1990’s, Albania unofficially flew their flag in the country of Kosovo, which did not have its own flag to speak of at the time, by the countries Albanian population. Today Kosovo has its own flag which distinguishes its own national heritage. The Eagle of the Albanian flag is also depicted on the reverse of the Albanian five Leke coin which was issued in the years between 1995 and 2000. Interestingly, during the 100th anniversary of the independence of Albania, to celebrate, flags were ordered from a Chinese company who misprinted the flags and the eagle heads were deformed. Today, there are still deformed versions of the flag in circulation. The republic of Albania is situated in South Eastern Europe and has a population of over three million. The country spans over 11,100 square miles. It’s capital, Tirana is the main economic and commercial center. Tirana is surrounded by other popular cities like Durres, Vlore, Sarande, Berat, Korce, Gjirokaster and Fler which make up the country’s most popular destinations and trading markets. The countryside is lush and green with waterfalls and hilly terrain and the weather is well balanced. Becoming a fast growing tourism destination, Albania welcomes vast amounts of new visitors annually which are helping the country’s economic state.